Do you need some advice from a fictional character? Submit your questions to this Google Form or simply leave them in the comment section! 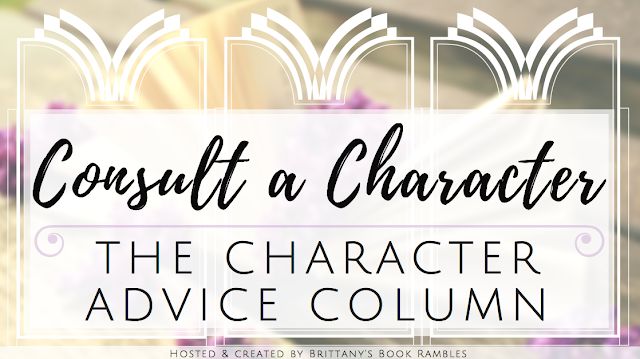 The authors characters pick which questions from my list they want to answer for each feature, so if you do submit a question, be sure to check back and see if someone has responded to it! 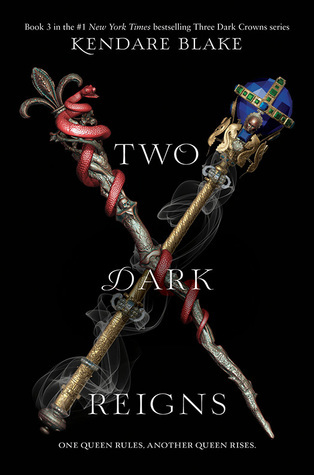 In celebration of the publication of Two Dark Reigns by Kendare Blake, we welcome Queen Arsinoe to to answer your questions. We all hope you enjoy her responses! The middle triplet of the triplet queens of Fennbirn Island. She was raised a naturalist, so she's good with animals, but is a poisoner by gift, so is good at eating things (even deadly things) and using them to poison people. I'm in high school and have a lot of opinions about social and political issues, but my parents don't like it. I wanted to attend an upcoming protest but I don't want to upset them. When I've tried talking with them about it, they can't even really explain why it bothers them. What should I do? I never had any parents, but parents schmarents. Go to the protest if that's what you want to do. They probably won't even find out about it, but if they do, they might be mad enough to finally tell you the truth about why it bothers them. While our parents go away on vacation, my sister and I are supposed to split the responsibility of taking care of my dog. He's older and needs to be let out to pee constantly, and she never does it! I know this because when I am home, I let him out a lot and he never pees in the house. But whenever I come home after she's been with him, there is pee everywhere and I have to clean it! She claims that she's been letting him out constantly and has no idea why he is peeing so much, but it has happened like that too many times to be coincidental. She clearly doesn't care because she knows I will be the one to come home and be forced to clean up the pee while she hides in her room. How should I teach her a lesson? I'm trying to eat healthier but my friend has been on a crazy baking spree. How can I respectfully tell her to stop stuffing me with cream puffs without hurting her feelings? I don't get you. No more cream puffs? Ridiculous! But if you insist, don't rain on that fabulous baker's parade. Re-gift those puffs to someone who wants them. Maybe someone on a secret, magical island. I keep walking over to stare into my fridge over and over again, as if I am expecting something new to appear. I can't explain why I do this, but I often feel the urge to do it when I am bored. Why am I so obsessed with my fridge? What is a 'fridge'? Is it where you keep food? If it is, then I'm not surprised you're obsessed with it. It's important to make sure that your food is safe and remains where you put it. Your fridge must be really pretty and full of pretty food, and I'd probably like to look in there, too. Recently, a huge flock of geese has "moved in" to my family's backyard. Granted, it's a huge backyard, but it's also A LOT of geese and they have pooped on everything! Should I try some scarecrows? I don't really have much bird-scaring experience, but I want them gone--along with their poop! Help? Don't piss off the geese. They're mean and they'll chase you. You will not scare them and neither will your scarecrows. Find something useful to do with the poop and get used to your new existence. Unless you have some of the naturalist gift, and then just tell them to poop on the edges of the yard. Who are some characters you'd like to get advice from? Remember if you would like to submit your own questions to be used to in this feature, fill out the Google form or simply leave a comment below! Haha, that 'Don't piss off the geese' made me laugh hard, but then I had a great time with the whole Q&A session :) Also, this just makes me wanna start this series even more! Right? There are aways so many of them and they leave so many little "presents" everywhere. I highly recommend this series! Arsinoe is a natural! So glad you enjoyed it. Thanks for stopping by! Yes, you should! I hope these books are on your TBR. Omg Arisone is brutal with the dog answer. 😂😂I'm cracking up I LOVE THIS FEATURE SO MUCH. YAY! I'm so glad you're loving it. I'll try to make this a more regular thing. I LOVE all her answers related to food. Arisnoe's a lovable character, and this interview showed her fun and quirky side so much. I really need to continue this series!! These are hilarious! I love that Arsinoe's advice is basically "do what you want". She seems like she'd be super chill to hang with. She's a great character and gives solid advice haha. Thanks for stopping by! I love these posts and these answers definitely make me want to read these characters! I hope you check this series out, I think you would love it!